The bill and legs are orange. The underparts are white. The tail is gray with white outer edges. 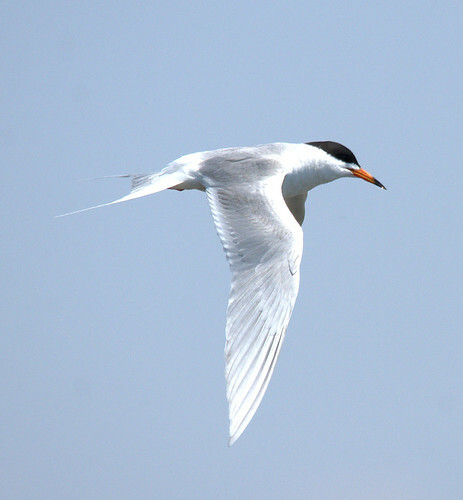 Caspian Tern (Sterna caspia) is a much larger bird. The bill is reddish-orange. 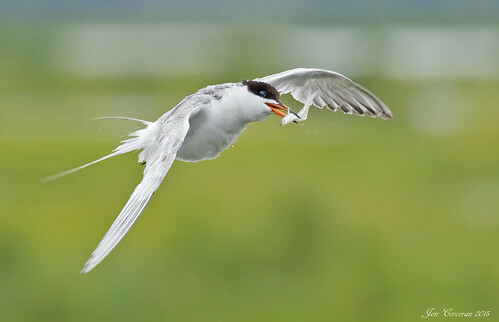 Common Tern (Sterna hirundo) bill and legs are darker red. The underparts are grayish. The tail is white with gray outer edges. The call is higher pitched and longer in duration. Forster's Tern, Sterna forsteri, preening. 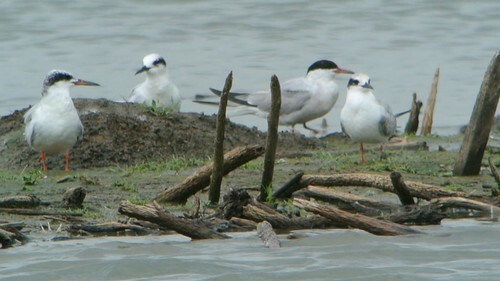 On 9/1/2012, I digiscoped some Forster's Terns visiting Riverlands Migratory Bird Sanctuary in Alton, Missouri. I thought they were all Forster's, until Bill Rudden pointed out that I might want to look again and see if there was a Common Tern amongst the bunch. And guess what? There was. Have fun finding the Common Tern. My wife Chrissy McClarren helped create this quiz. Thanks Bill!